2 Nights of Mali Music! | Virginia Friends of Mali 2 Nights of Mali Music! | Creating and promoting educational and cultural pathways to understanding and cooperation between the peoples of the African nation of Mali and the State of Virginia, USA. 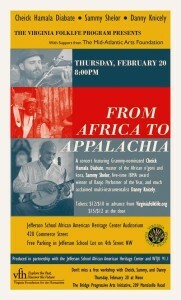 Thursday, February 20, 2014 from 7:30 – 10:00 pm at the Jefferson School African American Heritage Center in Charlottesville, Virginia. Located in C’ville’s historic Black neighborhood, Vinager Hill. More information email jsaahc@gmail.com and learn more about this recently renovated center at jeffersonschoolheritagecenter.org.